Cambridge Judge Business School : The Cadbury Archive : Letter, dated 16 October 1991, from Lord Chilver, chairman of the Innovation Advisory Board and copy of Chapter 3 from the IAB publication 'Promoting innovation and long termism', published 1990. 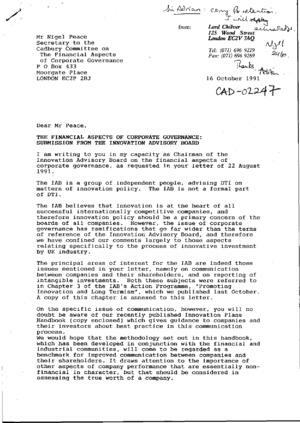 Letter, dated 16 October 1991, from Lord Chilver, chairman of the Innovation Advisory Board and copy of Chapter 3 from the IAB publication 'Promoting innovation and long termism', published 1990. Submisson concentrates on communication between companies and their shareholders, reporting on intangible assets and non-executive directors.